This blog is intended to keep clients and friends current on my investment management activities. In no way is this intended to be investment advice that anyone reading this blog should act upon in their personal investment accounts. There are other significant factors involved in my investment management activities that may not be written about in this blog that are equally as important as the things that are written about that materially impact investment results. Neither is this blog to be construed in any way to be an offer to buy or sell securities. To be notified via e-mail when new posts are made, click on the subscribe button below. To view previous investment strategies, click strategy downloads. Click here to view my Google+ page. As we approach year-end, I wanted to update you on our investment strategy and themes going into 2018. But first, I thought a review of the market year-to-date would be interesting. In the graph above, you can see that the large companies’ stock prices (as represented by the S&P 500 Index in the Red bar) soundly out-performed small companies’ stock prices (as represented by the Russell 2000 Index in the Purple bar). And Growth style companies (as represented by the Russell 1000 Growth Index in the Green bar) trounced Value style companies (as represented by the Russell 1000 Value Index in the Pink bar). What this tells me is that investors focused on the largest and fastest growing companies in the country when investing their hard earned money, and ignored to a large degree the smaller companies and the companies in more traditional industries like energy and food production. One item to note is that beginning in November, the value style companies began to out-perform the growth style companies, but we cannot know if this is the beginning of a structural change in the character of the market or just a one-off occurrence. There is more discussion of this later in this blog post. This graph shows a much different picture year-to-date. Small and mid-sized companies in the Technology sector still performed well, but the overall market performance was pretty pathetic. Small and mid-sized energy companies really took it on the chin this year followed by utilities and consumer staples. 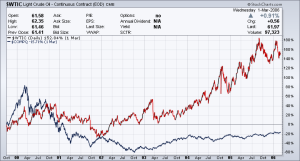 One of the signs of a mature market is that the largest companies start to significantly outperform smaller companies. It is based upon human nature where people who typically do not invest in the stock market see it going up and decide to put money in the market, either buying shares of the companies they know that are doing well (e.g., Facebook, Google, Microsoft) or they buy mutual funds that are heavily weighted into those same large cap companies. 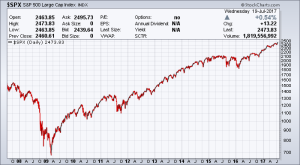 Historically, this is a sign that we are due for a correction – however, there is no way to know when that will occur. Countering this historic pattern, we have the corporate tax cuts that were just signed into law. These cuts will have a huge impact on corporate earnings, particularly for companies that whose operations are primarily domestic. For companies that have significant foreign operations, the impact on their income will be less. They will, however, be able to bring those earnings from foreign operations back into the US will a significantly smaller excise tax beginning in 2018, which many will do. Its hard to know how they will use that money when it is repatriated – some will pay bigger dividends to their shareholders, some will increase their stock buyback programs, some will increase wages for their employees, some will invest it in expanding their business, and some will do multiple of these things. Honestly I was struck by the announcements from several large companies that are beneficiaries of the tax cuts that they would pay $1,000 bonuses to their employees while others were raising their base wage to $15 per hour. I didn’t see that coming. Given that the value style companies are weighted heavily in domestic operations, the out-performance we saw starting in November could be investors anticipating the impact of the tax cuts on those companies earnings beginning next year. In the graph above, you can see that for the overall market excluding the S&P 500, the companies that had been underperforming (energy, staples) show positive performance whereas technology was down. 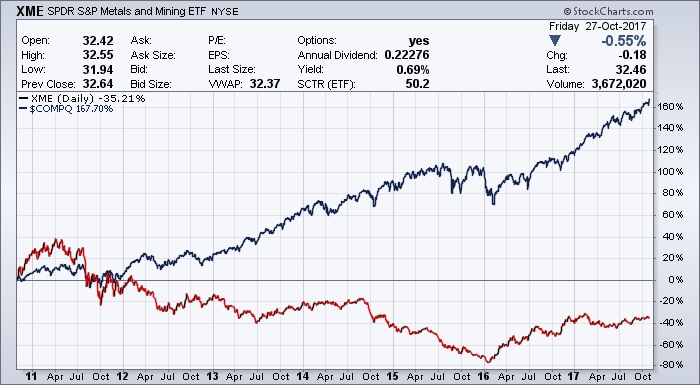 For the S&P 500 since November 1st, you see a similar pattern, with energy and staples both outperforming technology. In October, we rebalanced client portfolios ahead of year-end based upon changes we believed were going to occur. This rebalance began to transition our clients’ portfolios to reduce exposure to technology and add shares of energy and staples based upon our view that those sectors would benefit from tax cuts more than the technology companies that have significant foreign sales. We also began to swap within the technology sector, paring back our big winners with higher P/E ratios to focus on lower P/E companies and technology companies that had recent price declines, all as part of our updated Investment Strategy and Themes heading into year-end and 2018. 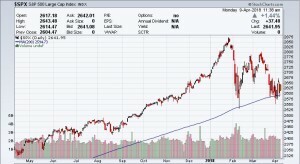 The additional benefit of this move is that portfolios became more defensive in posture so that they will ride out the next correction (whenever it may occur) with less downside – and when we have lower prices we can be opportunistic and more aggressive again to maximize portfolio performance on a recovery. Based upon equity valuations being in the 95th percentile, weak corporate earnings, tepid economic growth, and a slew of unknowns with a new president that has no experience in politics, we view the markets cautiously. We plan to maintain our above average cash & short-term bond positions in portfolios at the max 10% of equity exposure, but invest the balance in the themes noted above. We have moved to a more defensive posture within our portfolios, adding shares of mega cap (HON, MMM, UTX) as well as defensive (ADP, ECL, CTAS) industrials. We have also reduced our technology exposure and added some defensive staples (DPS, PEP, MKC) and health care (PFE) to client portfolios – while maintaining our overall equity exposure. 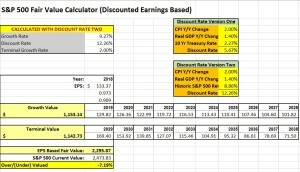 We will also reduce the overall P/E valuation of our holdings and be opportunistic when price corrections occur. 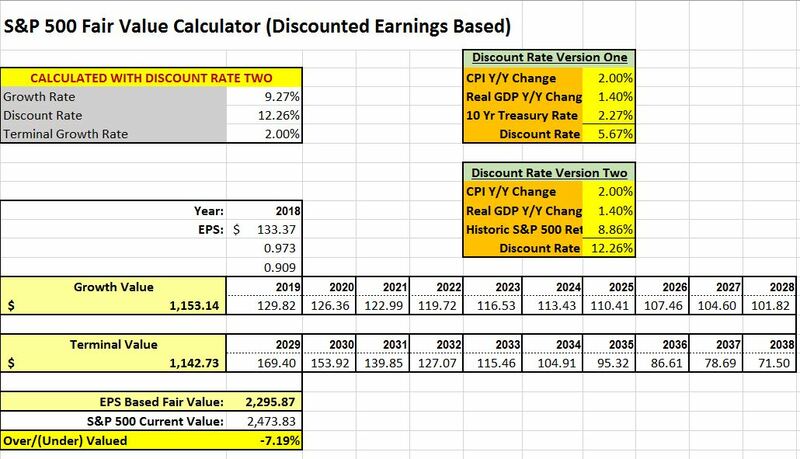 Based upon the Fed continuing to increase interest rates and their plan to reduce their balance sheet by $0.5 Trillion next year, the tightening monetary policy will eventually have a negative impact on stock prices. 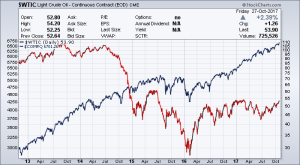 These moves will help to maintain client portfolio values if/when we get a correction. We will also add to portfolios the companies that should benefit from the tax cuts being discussed. The companies that will benefit the most or those with primarily domestic operations and the mega caps that have large cash balances outside the US. There are other themes that will develop as we get into 2018. We are on the sidelines watching the Bitcoin mania and do not plan to participate. However, the technology that runs the bitcoin network is a different story – it is revolutionary and could have a major impact on businesses in coming years – likely long after bitcoin bubble has burst. With Bitcoin dropping from $19,000 to $11,000 in four days, that bubble may be bursting right now. As we close out the year, I want to wish everyone a Merry Christmas, Happy Hanukkah, and Happy New Year! 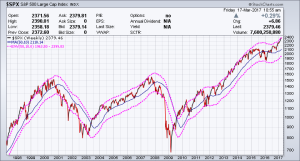 I have been very skeptical about this market for a very long time. With valuations stretched above the 95th percentile and complacency running rampant with investors, professional and individual, the risk of being in the market is high. However, nothing says that this situation cannot go on for a long time into the future before stock prices revert to the mean. My clients’ cash equivalent allocations in their portfolio are at their max level allowable by policy, so I have been working on booking profits in some high beta holdings (ie, the more volatile ones that have been screaming higher) and moving into things that have been beaten down or haven’t participated in the recent run up, like retail. I now have a market weight allocation in retail in client accounts, but to get there I had to buy things like Tractor Supply (which I initially had a loss in but now a nice profit), TJ Max, Ross Stores, and Home Depot – companies that seem to be able to weather the Amazon juggernaught. In income accounts, I bought a couple of companies that were smashed by the Amazon-induced retail bear market, Kohls and Nordstroms (Kohls I have a nice profit but the headline news in Nordstroms has kept that one down). However, I don’t think that is enough to keep portfolio values up if we get a solid correction in the momentum tech companies. So I wanted to share the next step in the strategy I am beginning to put into place. 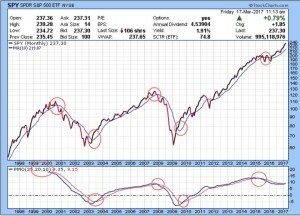 When we went through the 1999 stock market melt up with the NASDAQ stocks hitting unimaginably high P/E valuations, one of the things I did to prepare for the inevitable fall back to earth was to pick an asset class or industry that was just the opposite from the momentum dot.com companies in terms of being in a bear market while the dot.coms were in a bull market. In analyzing the dot.coms, you saw that people were throwing money at concepts that had no tangible value. The most opposite asset class or industry that I could come up with was the oil industry. It had been going through a mega bear market with oil dropping to $10 a barrel and companies going out of business. I started to accumulate oil companies very cheaply and reducing tech sector exposure. By over-weighting the energy sector, when the crash happened, my clients portfolios were protected by the rush into deep value investments like oil companies. By maintaining the overall equity allocation, they were able to participate in the upside during 1999 until the crash in 2000, but because they were in the opposite industry to tech – an industry that had already been in a bear market – they were able to recover from an initial market-wide sell-off while the tech investors continued to be underwater. 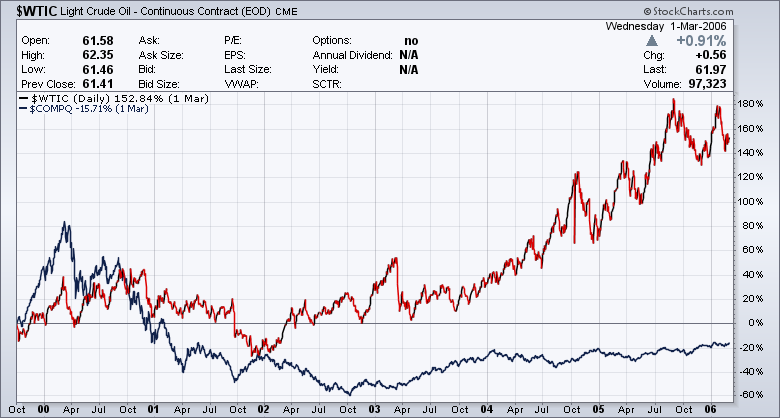 You can see the chart below comparing the performance of oil to the NASDAQ from 1999 to 2006. Today, we have the mobile Internet companies, the cloud companies, and the e-commerce companies that have skyrocketed in valuation. At some point we will need to reduce our exposure to those industries and invest in the opposite industry. 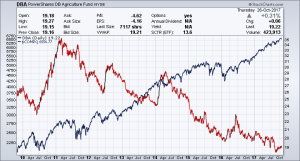 Since the Ag industry and commodities have been in a bear market since 2011, it is a natural place to begin – take a look at the graph below. I added a 1% Potash position this week to client accounts to begin our move to overweight the Ag industry. I will also likely start a position in the commodity fund DBA and begin to search for other suitable investments that have been left behind. Maybe this is finally the time for the “Scarcity of Water” theme to play out, too. Given all of the droughts around the world, I thought it would be a winner – but until earlier this year when my research came across he company Xylem the theme just wasn’t playing out as I thought it would. The mining industry also seems to fit the bill. Anyway, I understand this is a contrary idea, but since it has worked for me in the past and the current momentum push higher reminds of the dot.coms, dusting off the old invest-in-the-opposite playbook seems as wise as anything else that allows us to stay invested but reduces risk. 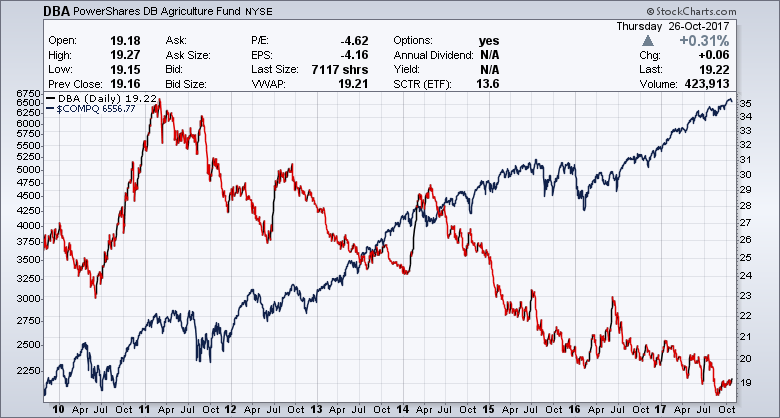 Being prudent and protecting hard won gains is critical to long-term investment performance. 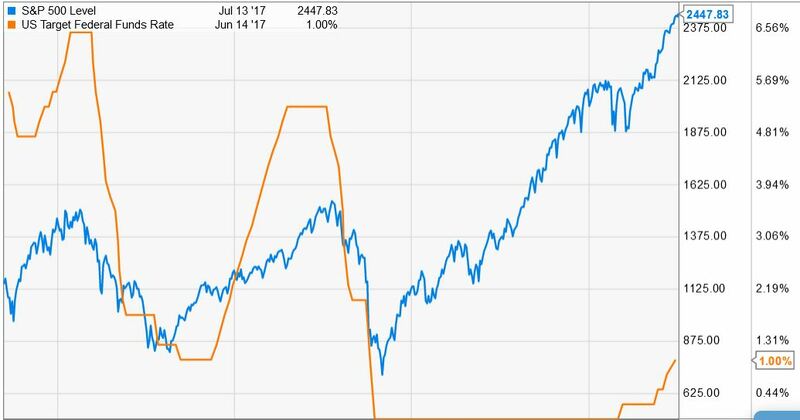 Its not the end of the world if the market goes down, but managing through the ups and downs of the investment cycle is always better than being caught by surprise with a huge down swing if you haven’t prepared for it. In analyzing the current state of the financial markets/investment world, my mind settled onto some major issues that should be impacting the stock markets but currently are not: (1) Rising Interest Rates; (2) Increased Risk Assumed by Investors; and (3) Equity Valuations. Normally, this would spook the stock and bond markets, sending both stock and bond prices lower. Higher interest rates impact corporate earnings in a negative way, and lower earnings lead to lower stock prices. However, we are not in a normal market any longer. Given that so many investors are now locked into passive investment strategies, there is no one actively employing Risk Management techniques like we and other active investment managers do. 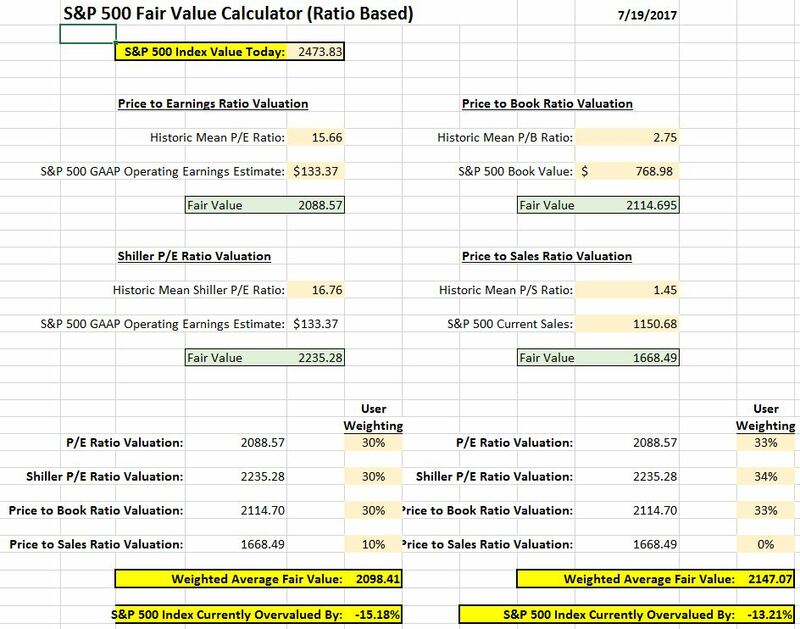 Passive strategies do not raise cash as valuations and risks rise. Passive strategies do not sell high beta stocks when they have had significant runs higher to protect the gains. Passive investment strategies do not re-position portfolios to emphasize defensive or undervalued sectors when economic conditions that negatively impact the earnings of companies present themselves. Record high levels of margin debt have historically shown that investors are too enthusiastic and not paying attention to the fundamentals. When the market goes south, the margin debt can wipe out their investments and they then have no assets to ride the recovery higher. When I compared the companies’ PEG Ratios to our benchmarks (1.2 preferred and 2.0 tops) I was pleasantly surprised by the number of companies that passed these benchmarks. With rising interest rates on a global basis, the macro economic picture is deteriorating. Combine this with investors’ assuming more risk than is warranted for the current stage of the cycle, and equity valuations on average well above fair value, now is the time for caution and prudent risk management – NOT aggressive buying of equities or of trusting your investments to a passive strategy with no one working on your behalf. Stock market returns do not come in a straight line. Stock market returns are not like receiving interest on a CD or a bond. Active investment managers can book profits and raise cash when valuations get too high then use that cash to buy back shares when corrections happen. Passive investment strategies ensure that you lose money in the correction and wait for the recovery only to get back to where you started. I do not know when this market will roll over and correct. There is no way to know what the catalyst for the pullback will be. However, when it happens, I and other active investment managers who have cash on hand to purchase stock in great companies at a significantly reduced valuation will be almost as happy as our/their clients when the correction subsides and stock prices resume their march higher. When that happens and we turn the page on this investment cycle, this Bizarro (Investment) World where prices continue higher in spite of materially negative issues will revert to an Investment World where earnings, cash flow, and valuations matter. And I will be happy to see that happen. Investment management is risky business and it is always best to trust a professional to deal with the complexities of generating and protecting wealth. 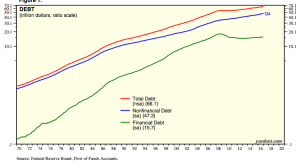 I ran across this graph of the total debt in our country and I was astounded. 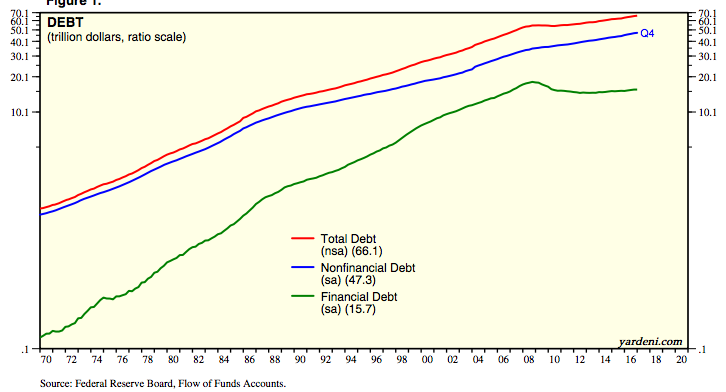 The graph from Yardeni and Assoc shows that our nation has total debt of nearly $70 Trillion. I had to stop and think about how much a trillion dollars actually is since my checking account is a few zeros shy of that number. Look at it this way, if you were to spend $115 Billion every hour of every day of one year, you will have roughly spent $1 Trillion. In 2016, the US government added $1.4 Trillion to the national debt, which now stands just shy of $20 Trillion. If you look at it from a per person standpoint in our country, each person owes $60,000 to cover the outstanding debt – or a family of four owes nearly a quarter of a million dollars. How can that ever be repaid??? When you add in the other debt, from states and municipalities, from corporations, from consumers, etc, you total $70 Billion. Its too depressing to think about because there is absolutely no way it will ever get paid off. We as a nation are collectively bankrupt – and the deferred liabilities like unfunded Pension and Healthcare Obligations of the US Gov’t of $20 Trillion (per the Business Insider) plus state municipal pension obligations of $1.75 Trillion (per CNBC) and corporate unfunded pension liability of $3.79 Trillion (per the California Policy Center) and we have a nearly $100 Trillion problem. The only way out of this is to continue to print money so that the debt is paid back in severely deflated dollars. 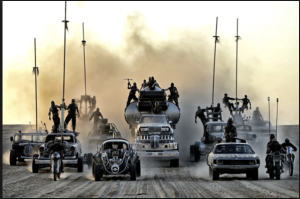 Demographics will not allow for adequate population growth to ensure GDP grows at a +4% level, so inflation is the only answer – or such a severe depression that all the debt is wiped out but I am not ready for a Road Warrior type of lifestyle. Maybe not tomorrow, maybe not this year, but at some point, the chickens will come home to roost and we will have some ugly decisions to make. At a minimum, our government cannot add $1.4 Trillion to the debt each year – don’t believe those news items saying that the deficit is shrinking like we have heard for a couple of decades. If our spending only $400 billion deficit per year as we heard in 2016, there is no way we could have put on $1.4 Trillion in new debt. The government has lots of ways to obscure what they do at both the state and national level, always follow the money and you will see what is really happening. 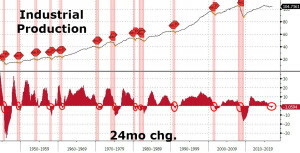 With the stock market surprisingly holding onto its gains in spite of the fact that: (1) economic indicators have turned down, and (2) the Federal Reserve stated today that they were on pace to raise interest rates again in June, we will continue to hold onto above average levels of cash so that we have funds to invest when we finally get the over due correction. The stock market months ago separated from the economic reality of our country – that cannot continue and the smart money is holding on the sidelines to buy when values are more compelling. I know it is hard to sit back and see the market at current levels, but its better to give up a couple of points of upside in favors of double digit upside in the not too distant future. In spite of the above statement, as companies in my favorite investment themes have a pull back in price, we are buying or adding to positions. Those themes are: cloud computing, selfies, experiences, home life, and pets to name a few. These are all things that are in secular upswings (businesses moving operations into the cloud; people wanting to look their best knowing that there will photos of themselves on facebook or instagram; the current trend of people not spending money on stuff but spending it on events or vacations that they can experience with families and friends; the trend toward staying home and ordering pizza, watching movies, and playing video games; and the fact that people will spend money on their pets through good times and bad, particularly since the pets are part of the family and add to the home life trend). How can two sources reach such diametrically opposed conclusions? Looking solely at the price graph in the middle, you see a fairly consistent upward trend with only a couple of corrections and the index near an all-time high. That sort of price action can be intoxicating and draw in investors who have been on the sideline waiting for another of those corrections in order to invest. 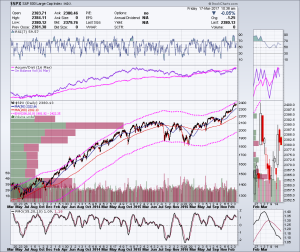 However, if you look at a couple of the indicators on the graph, I read those as troublesome for the market. First, you see the two pink dashed lines that bracket the price graph in the middle. 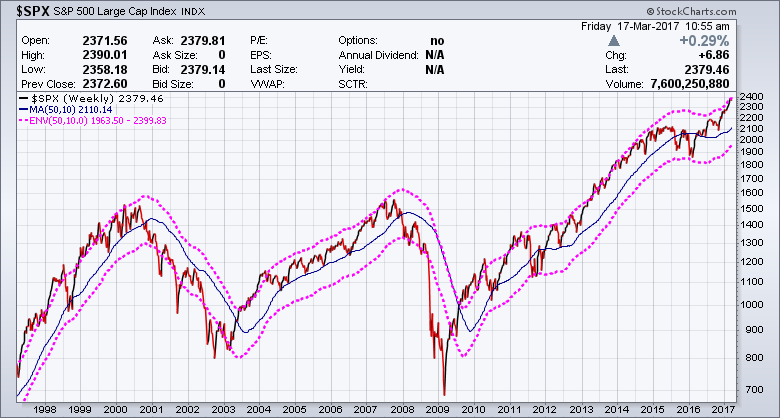 Those two dashed lines represent a level of 10% above and below the 200-day moving average. 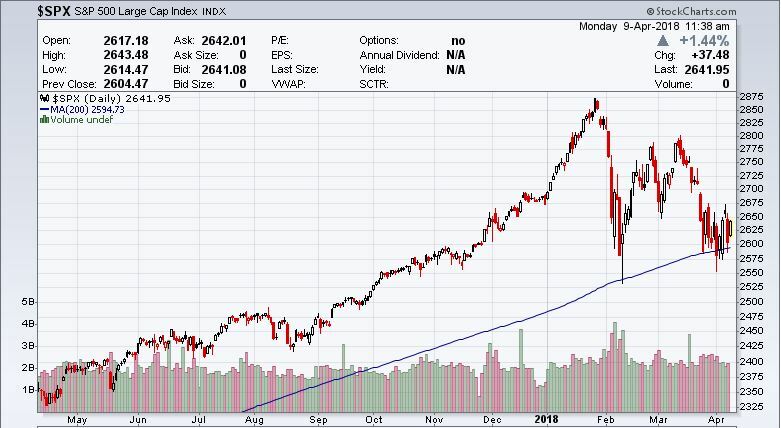 In previous posts here on the blog, I’ve written that these two levels are strategically important as the index historically has oscillated between levels that are either 10% above the index’s 200-day moving average or 10% below the 200-day moving average. 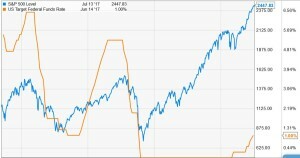 What this means is that from a historical perspective (and obviously there is no guarantee that the market will act in the same fashion as it has in the past), a safe time to buy stocks is when the market hits the line that is 10% below the 200-day moving average and important time to sell is when the market hits the line that is 10% above the 200-day moving average. If you look closely, the market touched the 10% above line a few days ago and has been weak ever sense. If you look back to the two corrections in August 2015 and January 2016, both of those drove the price down to that lower line, but the market soon recovered to higher prices. Below is a 20-year view of the index with a weekly instead of daily price graph: This 20-year view gives you some longer-term perspective. 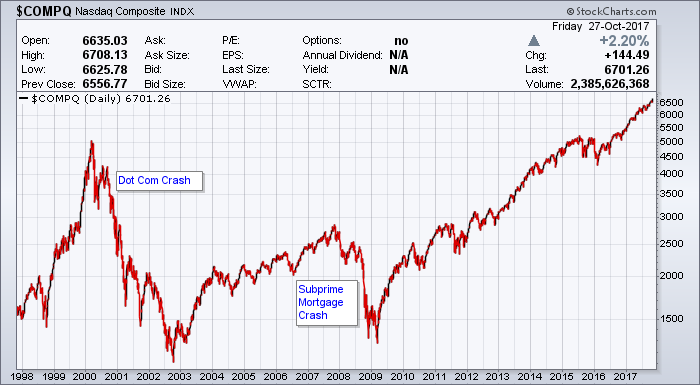 Even when the market falls apart like it did in 2001-03 with the NASDAQ crash and 2008-09 with the Subprime Debt crash, with the price graph dropping below the lower line, it is still a good indicator that you should consider putting some money into the market and NOT selling at the bottom. 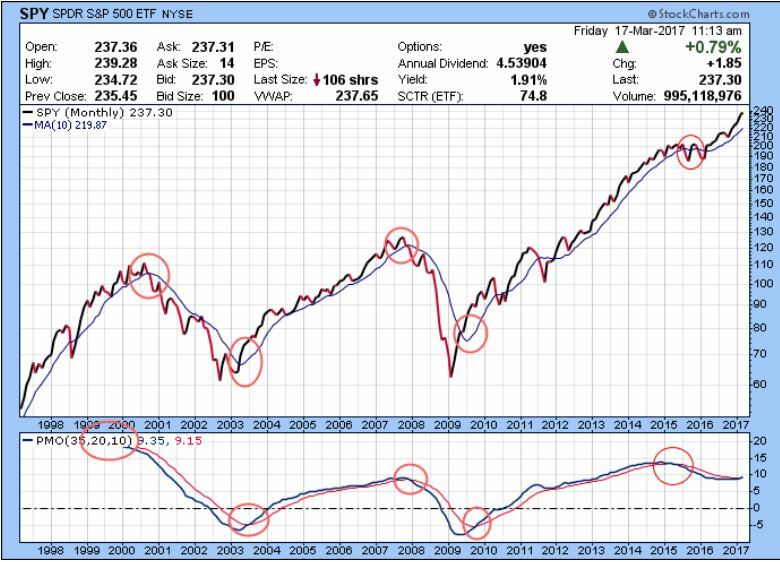 The other indicator that is bothering me is the PMO (price momentum oscillator) at the bottom of the 5-year graph above. 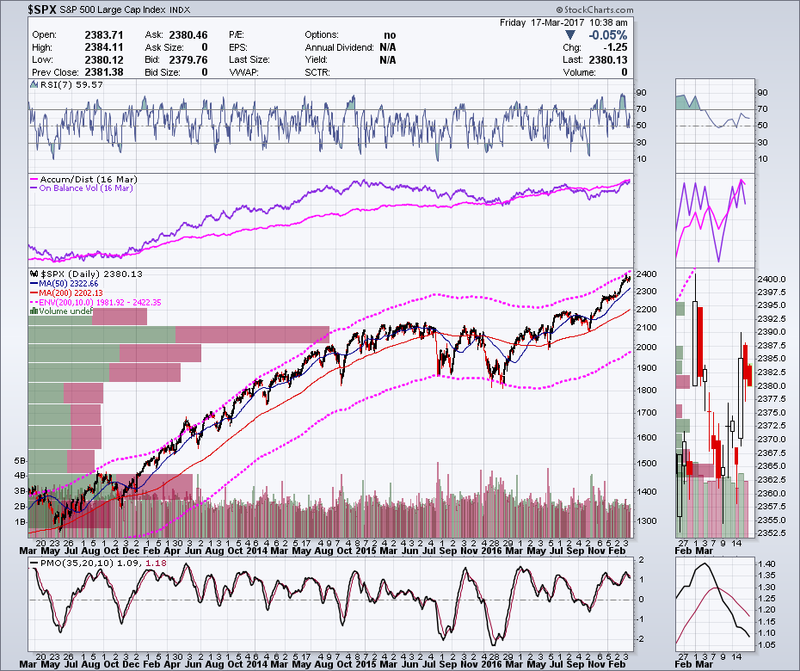 On the far right, you can see that the black indicator line has has fallen below its red signal line. This is telling us that even though the index has not yet materially fallen, the momentum behind the move that has pushed prices higher has weakened significantly. This chart is a monthly view of the index instead of a daily. You can see that I’ve circled that spots where the PMO changes direction and the market follows suit. 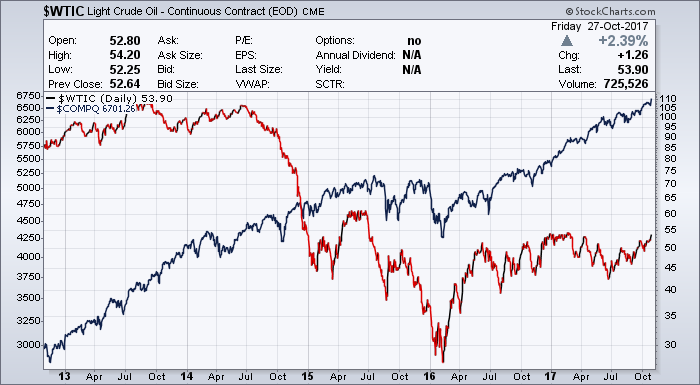 This has been a fairly reliable indicator of when the market is going to change direction. So which is right? 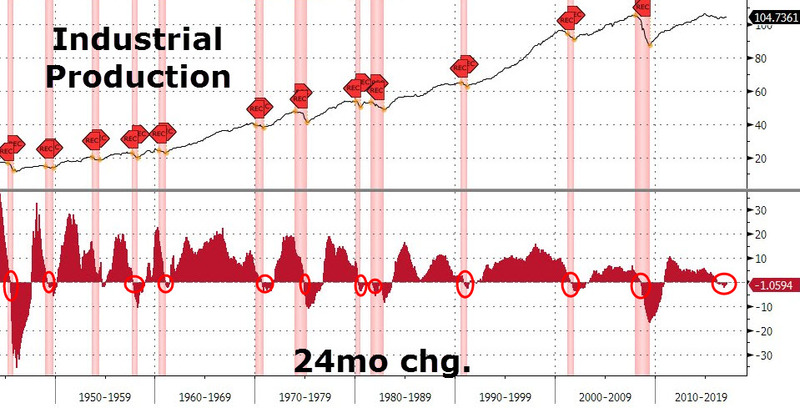 Are the economic indicators that are flashing warning signs of recession correct or is the stock market that has continued to power higher based upon the hope for tax cuts and simplified regulation correct? For what its worth, I don’t have the answer – only time will tell which right. 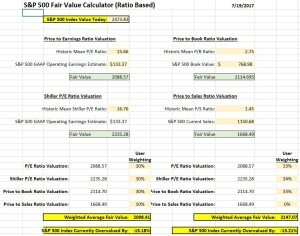 However, what I do know is that the stock market is over-valued by 10% or so and that we are due for it to correct back to the 200-day moving average or maybe more (see the prior blog post for a discussion of my fair value model for the S&P 500 Index to understand the 10% or so over-valued statement). Prudent investment management dictates that we maintain a conservative posture with regard to our investment activities. 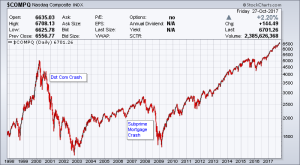 Because of this, we will maintain above average cash and fixed income reserves in order to have liquidity to buy our favored companies when the inevitable pullback occurs.